Tim J. Leech FCPA CIA CCSA CRMA is Managing Director at Risk Oversight Solutions--a firm that focuses on helping companies implement objective centric ERM and internal audit to meet escalating board risk oversight expectations and add real value. 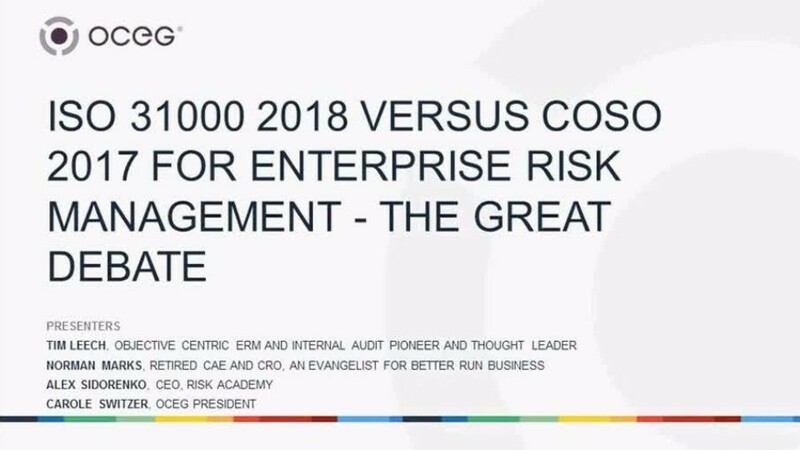 We have emailed instructions to access ISO 31000 2018 versus COSO 2017 for Enterprise Risk Management - The Great Debate to . Make sure the email arrives in your inbox: either add "support@oceg.org" as a safe sender to your email platform, or if you use Gmail, drag our email into your Primary tab.